AHTI Games is a casino operated by SkillOnNet, and it has become an interesting destination to visit for gamblers worldwide. After they launched, not any longer ago than 2018, it didn’t take much time before they made a name for themselves in the industry of online casinos. It’s easy to think that a new casino with little experience will have a tough time on the market, and we definitely understand why, but it is important to remember that there are many casino operators out there that have managed to take the industry by storm not long after launch. Therefore no one should underestimate the possibility that a brand-new casino can make a name for themselves only after a short period! 1) The design of the God is extraordinary, and the graphic is just mind blowing – there is no doubt in anyone’s mind who this guy is. The designers have done a good job! 2) Poseidon’s face is the logo to AHTI Games Casino. Therefore we thought it was worth mentioning a little about him because you will see his face as a part of the logo up in the left corner at all times. AHTI Games Casino has other good qualities that we would like to mention. They have four different licenses where they are being regulated by Swedish Gambling Authority, UK Gambling Commission, Danish Gambling Authority and Malta Gaming Authority. These are really good licenses, and they are there to make sure that the casino offers gambling activities to people from certain countries legally. Another important fact is that AHTI Games Casino has SSL encryption and several firewall services. This makes sure that sensitive information about users is being kept secure at all times. Below we are going to talk about the casino’s welcome bonus package, a little about if the casino works on mobile phones, what payment methods they have, their customer service, then about their games and software developers. This is why we recommend that you keep reading so that you can get loads of information about AHTI Games Casino before you decide if it’s worth checking out or not. Personally, we recommend that you do so because it’s definitely one of the better ones out there and we are sure that you won’t be disappointed by what they offer all their players, as well as new ones. Join AHTI Games Casino as a new player, and you will be able to get the sunken treasure. This is a 100% match bonus up to a total of hundred Superspinn! For every euro, you deposit you will get one Superspinn. The minimum deposit is €20, and the amount you have to wager is 30 x deposit + bonus money. This is a very simple bonus, but it’s also a great one! AHTI Games Casino is the perfect choice for those that prefer playing on mobile over a computer. Even if you are mainly a computer user, it still really great to know that if you want to play on the go, someday the casino is fully optimised for it. The payment methods available are PayPal, Skrill, Giro Pay, SOFORT, Paysafecard, MasterCard, Neteller and Visa. All deposits are instant, which is very standard in the industry. Withdrawals at AHTI Games are super quick. The pending time is 12 hours, and it takes 0 to 2 hours for the transactions to process to wallets. Per withdrawal, you can take out €5000, but not more than €10,000 a month. By clicking the help button on the website, you can easily find the most common questions players ask the customer service. If this doesn’t solve your issue, then you can contact them via live chat, email or through their social media accounts like Twitter, Facebook and Instagram. AHTI Games Casino certainly has an ocean full of casino games. With some over 1200 of them, it will take a long time to play through all of them with real money. With so many games in their library, there is no wonder why they cooperate with tons of developers. Some of these are Shuffle Master, BlaBlaBla Studios, Chance Interactive, Grand Vision Gaming and Sigma Games. There are many great things to say about AHTI Games Casino. Most of it you’ve heard already, but you will find more below. To mention a few things you’ll find more than 1200 games in the casino, and many well-known providers are delivering them to their platform, as well as some providers that are not as known as the others – but they are still good ones. If you decide to use the welcome bonus the casino gives to all new players, then you will be able to try a lot of these games out. Hopefully, you will be able to make a withdrawal as well after you have met the wagering requirement AHTI Games have. We recommend that you use everything the bonus has to offer! AHTI Games is an exciting casino where you will be entertained for a long while. 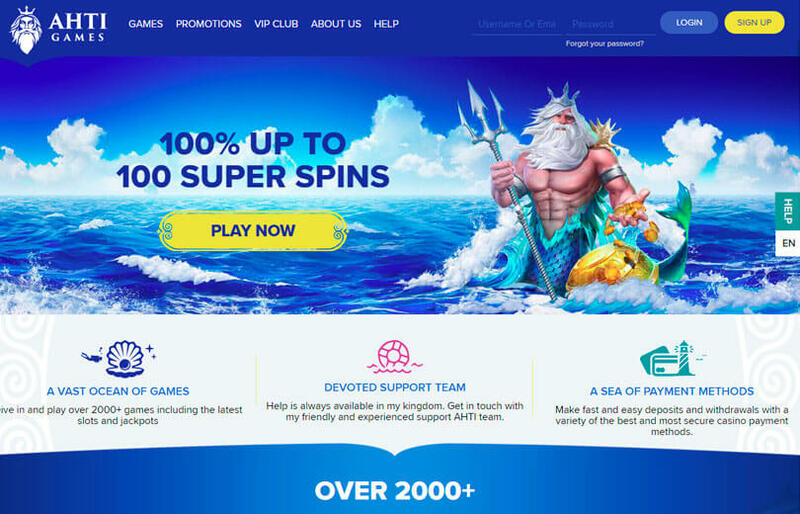 They have a tempting bonus offer that you can use as a new player, they have loads of games you can try, their customer service is solid, and they have all the payment methods that you need. Security is important to them, and the licenses are present.